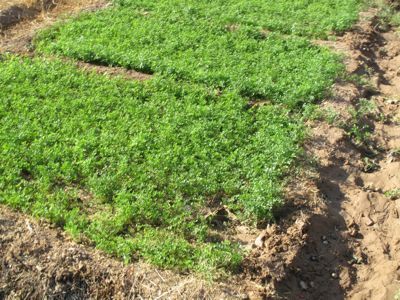 We headed to the front entrance of Amanjena at the appointed time, and a large dark green Mercedes limousine pulled up to transport us to the camels. I just had to laugh at the irony of this. The camels should be amused. We had opted out of a a real desert experience, what with the Teen in a cast and Mrs. MM having a serious sand phobia, so we did the tourist thing and headed to the Palmeraie, a section of town with massive villas, tons of palm trees and bands of camels for hire, waiting for tourists to fleece. I had a bad feeling about this from the start, but we weren’t planning on returning to Camel-land anytime soon, so figured we should just do it, if only to meet the Teen’s desire to ride a camel. 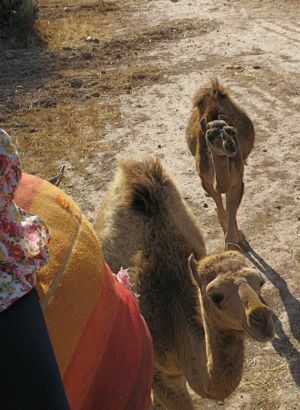 Madonna and Shakira had recently given birth, so the baby camels followed behind us, untethered. They were about 3-4 months old and cute. 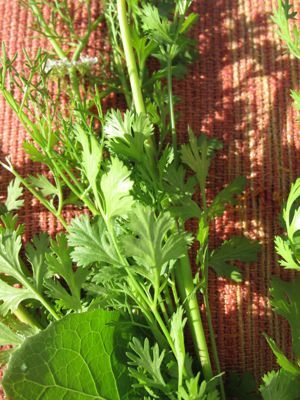 Patches of persil or parsley were growing amongst the palm groves, and apparently this herb is a camel favorite. The guy accompanying our trio of camel riders grabbed a bunch of the persil for each of us to hold onto and presumably feed to the camels when we were done with the excursion. 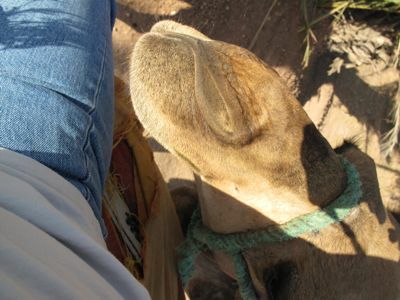 Shakira, the Teen’s camel, kept sniffing my leg and crotch area, wanting some of that persil and frankly, it was getting a bit annoying. :) At least my humongous Ayeesha kept farting back towards the Teen. Needless to say, we were laughing all throughout this adventure. Awww…I don’t mean to be rude, but that was a funny story. I’m still laughing my head off!! gahd. i got scared for you for awhile there while i reading. thank heavens it was only a pulled muscle. I’m glad your chest pains were nothing too serious, but that was seriously LOL! 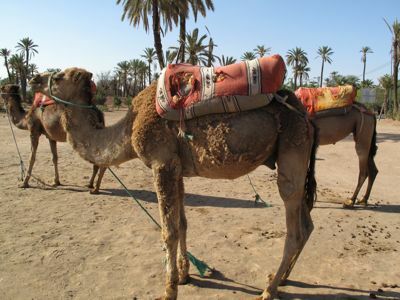 I empathize with you as I took a 3-day camel (they’re actually dromedaries) trek across the desert and was sore for what seemed like weeks after! They’re definitely not the most comfortable animal to ride! 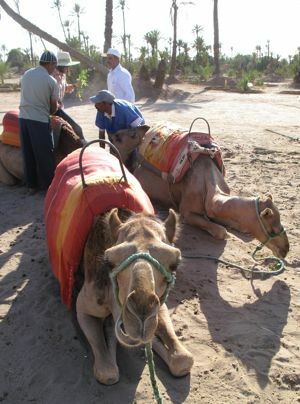 One of our group actually did fall off his camel when the camel fell going up a steep sand dune. It was a bit scary, but both he and the camel were OK. Our camels were not only farting, but also peeing and pooping in front of each others’ faces! Poor babies were tied very close together, so it couldn’t be helped! And don’t feel too bad about being fleeced in Marrakesh. EVERYONE gets fleeced in Marrakesh at least once, and badly fleeced at that (Fez was almost as bad, but the other cities I visited were not so bad). Good thing you haven’t tried taking the taxis! Whoa! Glad you are ok! Excepting the chest pain you felt, I find the part of your precipitate alighting from the camel funny. Could you have been the last straw for the beast? Your Guardian Angels must have been on super alert during that camel ride. Esp. for the Teen, who couldn’t afford any more injuries! We’re all glad you’re okay save for that pulled muscle, MM. Bad camels! Cute babies tho. Then again, wait till they grow up! Argh. What a wonderfully hilarious read on my birthday today! Sorry about your injury though. Last time I rode a camel was in Egypt, 1990s. They have a peculiar stink and their gait gave me camel-motion-sickness, that experienced so never again. the heart attack scare was, well, scary. :s i’m always afraid of getting sick while out of town or abroad, but a heart attack is toooo frightening a thought. I so needed this laugh. I’m sorry, but I laughed out loud and HARD! I’m sorry you got hurt, but I saw this going down a different path — one where your daughter falls off on her cast and … well, it would have been bad. Or that you got spit at and that is never a good thing, especially with a camel! Ewwww!! 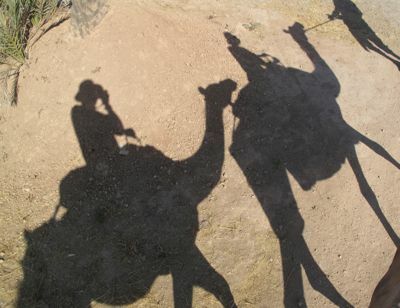 The times I’ve ridden camels have been a bit scary. It always feels as though you’re going to fall off. Hopefully you’re feeling better now. did you pay through aman or direct to the camel guides? just wondering who fleeced you. had i been there i probably would have whisked you to the nearest hospital right away to have that chest pain checked….comes second nature to me being a cardiac nurse :) What happened to the Teen’s leg? In all, it was a funny story. Glad youre okay though. “I figured if I was going to die, I was going to die in an Aman.” haha! Bit of camel trivia. There are two types, the Bactrian and the dromedary. Easiest way to remember? If you lay the B on it’s side, it has two humps like the Bactrian camel. If you lay the D on it’s side, it has one hump just like the dromedary camel! Convenient huh? i’m really sorry, MM…i’m concerned and all that..but this was just too funny! Isa G great mneu… gee canâ€™t remember the word. Actually, first question they put to you in the camelidae yard is, one hump or two? Apparently, the word camel itself derives from an Arabic root that means beauty which proves once more that it is indeed dependent on the beholder. “I figured if I was going to die, I was going to die in an Aman.” Best line ever! I am surprised that the cost of the camel ride was not made known to you by Aman. They usually have a folder of suggested activities in the room or at the library with the corresponding price. I took a similar camel ride at Aman I Khas in India opting for the camel to pick me up at the property and ride out in the desert. The ride was gentle and lovely. Getting on and off was nerve wracking but members of the staff of Aman made sure I was aware of how this was to be done and guided me accordingly. I remember it being fairly expensive but for me the experience was worth it. â€œI figured if I was going to die, I was going to die in an Aman.â€ LOL, I know it wasn’t funny for you then, but that one line just was sooo funny. I loved that,:). Am just glad it wasn’t an MI. @Isa, that mnemonic is good, but then again recalling the 2 kinds of camels will be another thing. MM, while enjoying such a hearty laugh over your encounter with the camel, my heart also went out to you and for you – the pain you experienced. 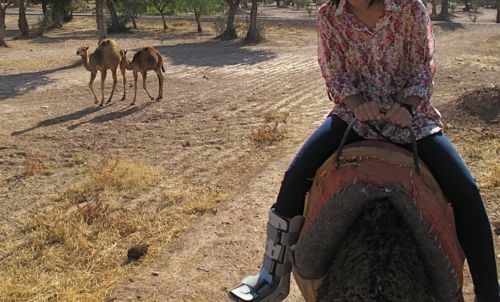 Similar story – also got fleeced with a 15 minute ride on a camel around Giza. Basta!! Love the first photo! swak na swak sa topic! Thank God you’re ok.The worst you can experience in a vacation is to get hurt…in a foreign land! But sorry MM, cannt help laughing.Your camel story is so funny!